Clermont, Change Your Dial to 88.3! 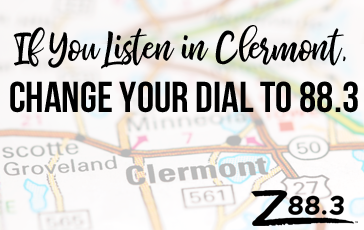 If you live or work in Clermont and listen to your Z on 88.7, it’s time to change your dial to 88.3 FM! When God allowed us to expand the 88.3 signal to 100,000 watts a few years back, it left Clermont with a crystal clear signal on 88.3 and 88.7. Our engineers figured out that moving our 1,200 watt 88.7 signal from Clermont to a 35,000 watt signal centered in The Villages, would give us the potential to reach over 450,000 new listeners! They have been hard at work making this move happen. That means if you are in Clermont, it’s time to switch your car and clock radio presets to 88.3 FM. We are constantly amazed at all that God is doing with your station, and this move is no exception. If you’re in Clermont, we’ll see you on the 88.3 signal from here on out!